Without wagons, the American West would never have been settled. Wagons, horses, and mules were the only means of transportation for thousands of years. It wasn't by accident that westward expansion and the manufacturing of wagons hit its stride in the 18th century, as these were interdependent. Most wagons were made in the East and shipped westward to the states bordering the frontier, along the Mississippi River. 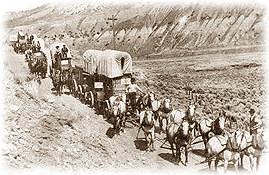 The wagons themselves then took families west along the Santa Fe Trail. In the early 19th century, wagon manufacturers starting springing up in the central states, eliminating high shipping costs. Wagon companies ranged from small shops (which produced a wagon a week) to large companies such as Studebaker (which claimed to produce a completed wagon every seven minutes).